An Amazingly In-Depth Interview with Finger Picking Blues Master ErnieHawkins. Ernie Hawkins is a modern link in a musical chain that stretches back to the early 20th Century. Hawkins was a longtime student and friend of Piedmont blues icon Reverend Gary Davis. He is the greatest living practitioner of the Davis style of fingerpicking and a master of the Texas blues of Lightning Hopkins and Mance Lipscomb. Ernie recently took a couple of hours to talk to me, via Skype, about acoustic blues, the Reverend and fingerpicking guitar. Jim Pharis -When did you begin playing the guitar? ErnieHawkins - Actually I started as a banjo player. I had a friend who played 5 string banjo who showed me how to play it. I was fingerpicking it right away. I never paid much attention to guitar until a friend lent me one. When I played it, something happened. It seemed like so much of a sweeter instrument. The fingerpicking on the banjo went straight to the guitar as soon as I heard fingerpickers like Elizabeth Cotton and Etta Baker. Around that time we started getting re-issues of blues records -Sam Charters and those people. As soon as I began fingerpicking guitar, everything clicked for me and I was hooked. I was playing pretty well and somebody gave me a copy of Harlem Street Singer (by Reverend Gary Davis) and that totally changed my life forever. Jim Pharis - It's amazing that you were able to immediately get what he was doing. He has such a powerful sound, especially compared to his contemporaries. ErnieHawkins - I vividly remember putting on Harlem Street Singer and listening to one song after the other. The songs were all so deep and he was doing it with such ease. It was mind boggling what he was doing and he was singing on top of it. The singing was so powerful, it was like nothing I'd ever heard. It was so powerful and so deep and just perfect. It still is. I hear him play and there's nothing like it. Jim Pharis - It sounds like a bright light, Saul on the road to Damascus, kind of experience. ErnieHawkins - It was! I had a friend from New York who said "you can just call him up on the phone. He's in the phonebook" I did. I went to visit my friend and called Gary but he was out of town. I was about 16 and I decided to move to New York City. I hadn't even talked to him yet but the day after I got out of high school, I moved. I had it all arranged. Then I called him up and I was able to talk to him and that was it. Jim Pharis - It was pretty bold for a kid that age to move to a huge city like that. ErnieHawkins - I was in a mode where I would do anything to find guitar players. I hitchhiked down to Georgia to find Blind Willie McTell (he'd died in 1959). There were some guitar players north of Pittsburgh, there was the caretaker on my Uncle's farm. I'd go anywhere to find guitar players because you couldn't find the records. Most of these guys were legends. You'd hear about them but there records were very hard to find. So if somebody said 'There's a guy down in West Virginia named Garland Love" we'd get in the car and try to go find the guy. Sometimes we'd find somebody and spend a couple of days playing and get to know somebody. Most of the time though, they were long gone. So for me to have Gary Davis there in front of me was a miracle, just a miracle. Jim Pharis - I bet it was. So some of your contemporaries were interested in the same thing? ErnieHawkins - Yeah. I was still in high school but I had friends who went to college. They were playing blues, bluegrass, fingerpicking, some good singers and song writers. So yeah, there were people around who were into the music. People would play a few Gary Davis songs but nobody was crazy about it like I was. It was the way to go for me. He was the best and he was available. I got a few more of his records before I met him. I got Guitar and Banjo and I learned a few of those songs. So, I was learning some things off of records but there were some things that I couldn't get. I thought I was playing them. Then I saw Gary playing them and he had his own unique way of playing them, with his left hand and everything. It was a whole new world. ErnieHawkins - Yeah, there were very, very few guitar books out. You had to learn it off of recordings or you had to have it shown to you. That was all there was. Today you can find all of the old blues and early jazz records as re-issues and in box sets. Back then it was all old 78's. There were a few re-issues of Bix Beiderbecke and Louis Armstrong, but that was about it. The records that were available were kind of expensive for a teenager. So you'd spend a lot of time at other peoples' houses listening to records. I did have a friend whose Dad was a record collector. Old jazz , Louis Armstrong, things like that. You were kind of on your own when it came to learning the guitar. If someone had taught me the CAGED System when I was 16, it would have made a lot of difference in my life. It's amazing what's available to people today. I think that it's great. 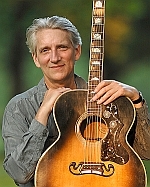 Jim Pharis - What was your first guitar? ErnieHawkins - A friend had an aunt who had an old Martin in the attic. It was a 1919 New York Martin. I paid $80 for it. It was a beautiful guitar. Small bodied, kind of like a parlor guitar. I traded it for a (Gibson) J-200 when I got to New York. Probably not the right thing to do since it would be such a valuable guitar now. I also had an old National. I lived on my uncle's farm and took guitar lessons from the caretaker, Pete. My uncle was the mail man for Wainsborough, PA, this little town out in the country. My uncle knew everybody. There was this guy named the Professor who was kind of an antique/junk dealer. We went to see him and he had a just beautiful old Gibson. A dark sunburst Gibson in a case, from the '30's. He also had a National that I picked up for $35. I played that all the time too. Jim Pharis - Do you still play a resophonic guitar? ErnieHawkins - Yeah, I do. Not too much though. I've just got the right J-200 for me. I have a couple of other J model Gibsons - a Southern Jumbo, J-50, a J-45 - and I play those. I like that sound, that Gibson sound. The maple and mahogany sound. I just like that sound and it works for this music. I kind of stick to wood. Jim Pharis - Reverend Davis played a National at some point in his career, didn't he? ErnieHawkins - Yeah, he recorded with it too. On some of his early recordings I think he was playing a National. Jim Pharis - I wonder why he switched? It seems like the National would be great for playing on the street. ErnieHawkins - It was loud but he too fell in love with that big Gibson sound. That was his sound, that big Gibson sound. You know, these Gibsons have better necks and stuff. They're easier to play, though he could play anything. Jim Pharis - I'd wondered about that. You are both so adept at using your left hand thumb, I wondered if that was why he switched to the Gibson. ErnieHawkins - I don't know. I think that he had that going on from the beginning. I think that was always part of his style. Jim Pharis - How long did you take lessons from Reverend Davis? ErnieHawkins - Until he died, although the last few years I was in school and didn't see him as much. I stayed in New York about a year, then I became restless and hitchhiked around the country for a little while. I moved back to Pittsburgh. I brought him to Pittsburgh a lot. Sometimes he would stay for a week at a time for festivals and concerts. I brought him to Pittsburgh when I got married and he performed at the ceremony. I made a lot of tapes when he was in Pittsburgh. I've still got them and I'm going to put them out on CD. We stayed close for years. Right up to the time that he died. Jim Pharis - How structured were the lessons that you had with him? ErnieHawkins - They weren't structured at all, he would just play. If I asked him to play anything in particular, he would play it. He could slow it down, show me notes and stuff if something was complicated. He showed me Samson and Delilah, how the notes worked. The counterpoint thing . He showed me a lot of the Gospel songs. Like, I Belong To The Band has a complex bass movement. He showed me every note of it. He got to the point where he believed that I really wanted to learn the music. Because of that, he was willing to work really hard to teach it to me. So, we spent a lot of time working on his songs together. Sometime we would just play together. As time went on, I was picking up stuff a lot faster, too. Jim Pharis - It does sound like a mentoring relationship. ErnieHawkins - I was pretty lucky, he was a great teacher. Jim Pharis - Did he have a formalized approach to chords like the CAGED System? ErnieHawkins - He did. I didn't know enough theory-wise to ask him how he thought about it. The more I studied, the more I realized how he thought about it. The more that I realized what the CAGED System was, the more I realized that he was using it. The exact same chords, but he had his own way of playing it. He had a way of playing with his left hand that was unique to him and very economical. He could play all these chords on the neck with very little movement, like a jazz player. He was very adept and knew how all of the chords and arpeggios worked together. I didn't know enough to ask him about it. I was just learning songs, basically. I was learning his style at the time. When somebody showed me what the CAGED System was I realized that I knew it. It was just never shown to me as that. It was never called that. Once it was called CAGED, it all fit together. I realized that I'd learned that from Gary Davis. He knew the neck, cold. Jim Pharis - He must have. He liked to play in the key of F didn't he? There weren't too many of his contemporaries that could do that, were there? ErnieHawkins - Yeah, he taught us how to play in F. He had some great F stuff. There were a lot of great popular songs in F that he could play that are so fun to play. F is a beautiful key to play in. Jim Pharis - Yeah, I started learning Devil's Dream and thought it was with a capo on the first fret. Then I heard one of the bass notes and thought, 'that's not right'. ErnieHawkins - You know United States March is a virtuoso piece in F. He had several pieces in F - Darktown Strutters Ball, Walking The Dog, an old time dance that works well in F.
Some of the Gospel things in F are sort of modal and very, very tough to play, like Blow Gabriel. They're from a whole 'nother world. Nobody else plays anything like that! You have to wonder where they came from. Jim Pharis - Who do you feel was an influence on him? Other guitarists or piano players? ErnieHawkins - When Louie Armstrong records came out in the '20's, everybody heard them. I know Gary Davis heard them. You hear all of those runs. He told me when the records came out they would play them out on the street. He'd walk by and learn the song that they were playing that day. He learned every song that came out every day, he said. Also, he was learning them in the keys that they were played in on the recording. He loved listening to the jazz guys. He loved Lonnie Johnson and Lonnie Johnson played with Louie Armstrong. He loved Blind Willie Johnson and Buddy Moss. He loved Blind Blake and knew all of Blind Blake's songs. He said that he could imitate any guitar player. He could play like anybody, and he did! Jim Pharis - Davis played that double thumbed bass note that reminds me of Blind Blake’s playing. Between them, who influenced who? ErnieHawkins - Davis has a different way of playing it. Davis has a way of playing it that uses the thumb. I think that Blake uses two fingers. It's a way of playing triplets. He learned it from Blake. Everybody learned it from Blake. Everybody learned certain runs and progressions from him. Gary had his own way of playing it because he used his first finger and thumb and he doubled his thumb up a lot. Jim Pharis - Did Davis ever show you anything that he'd gotten from another guitarist? A lick or something that he felt was so important that you should know it? ErnieHawkins - Rumor has it that he learned some of the instrumentals from Blind Willie Walker. Walker was the older, senior, guitar player. The played together in a string band in the 1910's. Walker was really another virtuoso so it's possible that he learned some of the instrumentals from him. Jim Pharis - Did you get to study with any of Davis' contemporaries? ErnieHawkins - Some, none to the same degree as I did with Gary. I was able to spend a good bit of time with Mance, which was really good for me. I spent a little time with Son House and Fred McDowell. I really loved Fred McDowell. I'd meet people when they came through to play or at festivals. I feel pretty lucky that I got to meet some of these guys. I met Robert Pete Williams. He was just terrific. He was a Louisiana player who had a unique style. It was very African sounding to me and, somehow, I was able to back him up and play with him. You just had to let it all go. We spent a lot of time playing together. He was a hard guy to back up because he was so individual. He was a truly great artist. There was a guy named John Weston, I don't remember if he was from Louisiana or Arkansas, that I met at a festival in Columbus. We hit it off real well. When I was down there playing King Biscuit he was getting sick, he had cancer. If you can find anything by him, he's well worth hearing. Jim Pharis - Did somebody actually show you the CAGED System? ErnieHawkins - No. I was playing and this jazz player who was listening to me said "you must know the CAGED System". I told him that I didn't and he started to tell me about it. I realized that I did know what he was talking about. I just hadn't strung it together C shape to A shaped C and so on. I figured out the arpeggios and scales in the system and that tied it together for me. I could make those connections because those were the connections that Gary Davis played. Giving it a name like CAGED kind of structured it for me. Jim Pharis - Have you used a similar methodology to figure out more extended harmonies? Things like seventh chord scales? ErnieHawkins - Everything fits into that (CAGED System). All of your scales, chords, arpeggios and progressions - everything fits into that. It's really kind of simple in a lot of ways. In other ways, it's limitless because everything is there. I worked out the information in the CAGED DVDs just by teaching people. The more that I taught people, the more I realized that this was a good method to teach them. Jim Pharis - On the CAGED System instructional DVD's you show a 1-4-5 progression at each position. For a C shaped C you'll show a C-F-G progression. For an A shaped C you'll show A, D and E shapes. Why use that approach? ErnieHawkins- Most people are familiar with that kind of progression. Also, if you show a song like Blue Monk in every key and in every position, that's when it really comes together for them I think. That's a good song because it uses the chords that connect the CAGED chords. Jim Pharis - What are your thoughts on self teaching with instructional materials versus lessons with a teacher? ErnieHawkins - Whatever works for you. Gary Davis told me early on, whatever works for you, use it. If you can learn it from a book, learn it from a book. If you can learn it from a teacher, learn it from a teacher. Whichever way works for you, use it. Ultimately though, there's probably no better way than sitting in front of a master and watching them play. That's the way this music (blues) always was. It's an oral culture. Now, for the most part, people use things like DVDs. If I'm teaching someone like Gary Davis taught me, that's a chain, an unbroken chain. It comes from the people who taught Gary and the people who taught them. It continues down to the people that I teach. DVDs are a two edged sword. People can watch them and see how Gary Davis did it. If he'd died in 1950, nobody would have known how he did his early stuff. Some genius would have figured out a song or two but it would have been a really tough to do. Because it is on DVD, it won't get lost. That's a great thing. It's easy to imagine that there were many great artists in the folk tradition that no one knows about now because they weren't recorded. Jim Pharis - In some of your playing of traditional blues, it sounds like you've rearranged the song. On other songs it sounds like you're playing a note-for-note version. Why the different approaches? ErnieHawkins - If Gary Davis worked really hard to show me something, I try really hard to play it the way he showed me. I feel somewhat obligated to play it the way he showed me. I also feel like Gary Davis gave me my style. My individual style of playing goes through him. When I play a blues song by someone else, I'll play it in my style, which is a Gary Davis influenced approach. That approach includes playing variations and improvising. Jim Pharis - So that's more of an interpretive thing, rather than preserving a style of playing in a capsule? ErnieHawkins - Yes. On the Gary Davis instructional DVDs I try to play everything like Gary played it. I try to become invisible and pass on his style of playing. When I perform the songs, I improvise on them, things get changed up. Gary Davis did that. The ability to improvise is built into this style of playing. Jim Pharis - In your experience, what's the most essential quality that a person should have to become a good player? Talent? Perseverance? ErnieHawkins - Passion. When a person is passionate about something, no matter what happens, they're going to learn it. Teenagers have that passion about a lot of things. Many people that I know started playing as teenagers. Of course, you don't have to be a teenager to be passionate about playing. I still have it! The main thing is to have a passion for it. If you do, you'll learn it. Jim Pharis - Is there any key bit of knowledge that will accelerate a students learning to play? ErnieHawkins - The CAGED System is the key to it all. You can apply it to any type of music. It's the foundation of music theory and how things work on the guitar. If you just play the 1-3-5 arpeggios it helps. You become more accustomed to that sound. If you can do that all over the fingerboard, the more musical you're going to get. It's going to make it way easier to learn anything. I think that if I had learned more formal music earlier on, it would have helped me. Things like reading music. Everything that I learned when I was young was by ear. Now I know how to read music. Like Gary Davis said, learn however you can. Jim Pharis - Do you think that it's important for a player to learn the names of the notes on the fingerboard? ErnieHawkins - Sure. If you learn how to read and can relate those notes to the fingerboard it really helps. When you learn to read, you can learn any song, note for note, the way the composers intended it. The way I learned was that somebody gave me a Fakebook of Christmas music. I knew all of the songs so I went through the book and worked out the songs. In every song there is some little thing that makes it really beautiful. The more of these songs that you work out, the more you're learning to read music. That was really kind of a breakthrough for me. Now I love going through sheet music and learning songs. I know that I'm going to get every twist and turn that the composer wrote into the song. Jim Pharis- Do you use a lead sheet with chord diagrams and melody line when you're working up a new arrangement? Especially on the old jazz tunes that you do. ErnieHawkins - If I have that available to me, I definitely will. It helps a lot and it's fun to do. Jim Pharis - Where do you look for source material, especially the old jazz tunes that you've been doing lately? ErnieHawkins - That's straight from records. I've gotten to be good at doing that over the years. Plus one thing that I do that helps is use a computer program called Transcribe. It lets you slow a song down without changing the pitch. It also lets you put the recording in any key. You can take a song like Potato Head Blues or any other jazz tune, slow it down and learn it. It's great! That helps a lot. Jim Pharis - When doing one of these arrangements, do you notate what you're doing in any way? ErnieHawkins - No I don't. I should, it would make things easier, but I don't. Jim Pharis - Do you have any suggestions on developing coordination in the right hand? ErnieHawkins - The right hand is the most important. Doing arpeggios is a good way to develop it. That and just playing. The more that you play, the better you'll become. Jim Pharis - On some of the YouTube clips that I've seen, you seem to finger two strings with the same fingertip. ErnieHawkins - Yeah, you just do whatever you can to get the sound that you need to get. Find any way to do it. There aren't any rules. Jim Pharis - Are there advantages to fretting with the left hand thumb rather than making a barre chord? ErnieHawkins - Sometimes there are. Using your thumb frees up other fingers to allow you to play the melody. Sometimes I use a barre but most of the time, playing Gary Davis style, it's better to use the thumb. Jim Pharis - I've noticed that your right hand thumb is positioned toward the end of the fingerboard and not buried behind your picking fingers. Do you feel that this is the best approach to take? ErnieHawkins - I've seen people take all kinds of approaches to it. I do feel that a hand position like what I use is a good way to do it. It is for me, let me put it that way. If somebody is using a different approach and it works for them, I wouldn't mess with it. If I was teaching someone, I'd teach them the way that I do it. Jim Pharis - Is there a secret to developing control of the right hand thumb? ErnieHawkins - Practice, practice, practice (laughs). Jim Pharis - How do you approach learning a song with a complex guitar part and vocals over the guitar part? ErnieHawkins - I begin with the bass and the melody. I learn the melody on the guitar and sing along with it. For me that works, just learning to play the melody and singing it. Of course, you're singing it in your head as you're learning it. That makes it hard to say which comes first. I guess that I get comfortable playing it and that makes it easier to sing. Jim Pharis - Do you have a suggestion on any other approach to learning a song by ear besides using Transcribe? ErnieHawkins - Transcribe is the easiest thing to use because you don't have to re-tune the guitar. It's very rare that something's going to be in tune. Also, if you're learning a jazz tune you may not want to be learning it in E flat or B flat. It used to be that I'd have to re-tune the guitar to learn a song. Sometimes I'd have to tune it down three or four steps. That’s tough if you're learning a complex Bix Beiderbecke tune, or something like that. This invention, Transcribe, is just a fantastic thing. Jim Pharis - How do you keep the styles of the artists that you're expert at separate? How do you keep Gary Davis licks out of a Lighting Hopkins song? ErnieHawkins - I don't know. They're just really separate styles of playing. I really like the Texas style of blues. It just came easy to me. I could see it and feel it. I don't really have an answer to that question. Jim Pharis - When learning a classic jazz tune, are you using the chords that are on the recording or are you substituting chords? ErnieHawkins - I find my own way through the chord changes. You've got to get the chord progression down. If I'm learning a Louie Armstrong song, for example, I'm learning the coronet or trumpet part. I think that the Gary Davis style works really well for that type of playing. The thumb is playing the orchestra. He (Davis) had a real light, melodic style that could play Louie runs. When he's playing those jazz tunes he's thinking like the coronet player. Gary's style is so perfect for these tunes that that's how I approach it. Jim Pharis - Is it fair to say that you approach this material in a melodic way rather than chordal? ErnieHawkins - I do both. The melodic line is really important. But everything else has to fit in too. You can hear it in Gary's playing. The finger plays the melody and the thumb plays everything else. It's a very orchestral point of view. A clarinet, a piano, a bass player. All the different voices. Jim Pharis - Can one player play all of those parts? ErnieHawkins - No. You're abbreviating everything, you're suggesting things. It's got to move, to swing, but you're suggesting these instruments. Jim Pharis - On another topic, do you prefer playing solo or in a group like you did on your last recording? ErnieHawkins - Unless I was playing in a blues band, I've always been a solo player. On the last recording, Whinin' Boy, I played with some fabulous old time players. I loved it. If I have an opportunity to play with the band, I take it. On most of my situations, though, I can't take a band along. In cases like that, I'm very happy playing solo. Jim Pharis - How much do you have to change your style when playing with a band? ErnieHawkins - Not that much. I do more chording and I step back a lot if someone else is playing. We also do a lot of duets and I play more of my fingerpicking stuff. I become more of a piano player. I'm playing bass, melody and chords, like a piano player. I enjoy that. Jim Pharis What new projects are you working on? ErnieHawkins - I'm working on two new projects right now. One is a Bix Beiderbecke DVD and the other is a Big Bill Broonzy DVD. Jim Pharis Which part of Broonzy's career does the new DVD cover? ErnieHawkins - It covers the music from the latter part of his career. Jim Pharis How did the idea for it come about? ErnieHawkins - Actually it was Stefan's (Grossman) idea. Of course, I've been a Big Bill Broonzy fan for a long time. He asked me to do it and I thought that it was a great idea. A project like that gives you the opportunity to dig really deeply into someone's playing style. It's like the Lightning stuff. You may love somebody's playing and listen to them a lot, but until you figure how to play like them and show somebody else how to play like them, that's a whole different story. It's always, to me, a great thing to be able to do. I love doing it! It's like I have a day job, but my day job is figuring out how to play like Big Bill Broonzy. It's a lot of fun and a great education. Any time that you sit down and try to learn these deep styles that some of these guys played, it's going to be a good thing for you. Jim Pharis Do you thing Broonzy developed his style on his own or did other guitarists have a big impact on him? ErnieHawkins - That's a good question, you'd really have to ask a scholar. You hear others in his playing, a lot of Blind Blake mainly, of course you hear Scrapper Blackwell. Everybody heard Scrapper Blackwell with Leroy Carr because they were so ubiquitous and everyone loved them so much. When he started out playing he had kind of a Delta style, with that one steady bass. He was just a master at playing, and ragging, that style. Playing those C rags and D rags, just a master at it. He's second only to Gary Davis in playing those C blues, too. Shuffle Rag and all of those beautiful C blues. He's just a very likeable player. Jim Pharis Tell us about your latest CD, Whinin' Boy - how the idea came about, how you chose the material for it and the band concept. ErnieHawkins - I got out that Library of Congress recording of Alan Lomax interviewing Jelly Roll Morton and was listening to that. I started really getting into listening to him. I'd listened to him years ago but didn't have any of my records anymore. So I got this CD re-issue and was listening to that. I bought three or four box sets, piano rolls, everything. Listening to all of that kind of put me back in the '20's. The Louie (Louis Armstrong), Jelly Roll, King Oliver, Bix (Beiderbecke) - I guess that I just got kind of obsessed with all of that stuff. Whinin' Boy is the album that came out of it. Jim Pharis Do you have another album in the planning stage now? ErnieHawkins - Yeah, I do. I'll definitely have all of my guys, my players, on it. I'll do some more Jelly Roll tunes, some standards and some blues. It'll be somewhat in the same vein as Whinin' Boy. I do want to do another solo blues CD, maybe with a harmonica player. Maybe the trombone, I don't know yet. I've got a lot of songs in my head that I want to record but I'm not sure how I want to do them yet. Jim Pharis - Does the approach that you're going to take on a particular song evolve over time? ErnieHawkins - Yeah, it certainly does. I've got a great producer, George Hyde, an old time music guy. As songs start to get recorded we get ideas and start calling other players and the songs evolve like that. It takes a life of it's own, if it's going to work at all. Hopefully I'll get a CD or two out this year. Right now, though, I'm working real hard at getting the Broonzy project done. Then I want to do a DVD of fingerpicking Bix Beiderbecke tunes. Jim Pharis - Will there be much of a market for the Beiderbecke project? Fingerstyle guitarists know who Broonzy and Gary Davis are but Beiderbecke is a little more unknown in that world. Jim Pharis - I'm that far out of it, am I? ErnieHawkins - I don't know, I'm just kidding. Maybe I'm that far out of it. A handful of people would be interested, I'm sure, as there always are in my stuff. Hopefully I'll get other people listening to it and realizing how great this music is. If I can spread the Word a little bit and get something going, that would be wonderful. Jim Pharis - Tell us about your most recent instructional DVDs. ErnieHawkins - I did another one of Lightnin' Hopkins. His early stuff. The first Lightnin' that I did was of songs that there were films of. That way you could see him playing them and play along with him if you wanted to. Seeing him doing it is really indispensible. Going back into his early stuff was really a revelation for me. That was more fun than anything. You listen to Lightnin' on the old stuff and it's so good. It was the stuff that was doing it for everybody back in the '60s. He played electric and acoustic equally well. He was a real pioneer and everybody learned from him. When you go back and listen to the early stuff, you hear the tradition that he's coming out of. You hear him playing in Dropped D and A in Dropped D. You hear the tradition that he was coming from and what he did with it. He was just brilliant. Fantastic, really deep stuff. I'm really grateful to be given the space to really listen hard to this stuff, trying to puzzle it out. Talk about an education! If you want to learn to play the guitar, you dig into the recordings of these old guys. You listen and listen and listen to see how it works. That's an education in itself. That's where the stuff is. Jim Pharis - There isn't really a shortcut for that, is there? While it's one thing to be shown how to do it, to get the feel for it, you just have to immerse yourself in it, don't you? ErnieHawkins - Yeah, you really do. The more that you do it, the better it will work. That's true of everything. Jim Pharis - How did the Louis Armstrong DVD come about? ErnieHawkins - It started like the Bix project. I was listening to a lot of Louie stuff, especially the early stuff with the Hot Five's and Seven's. I realized how perfect the Gary Davis guitar style is for playing Louis Armstrong band tunes. It hit me like a ton of bricks. Gary Davis is playing all of the same runs. He's doing all of the bugle call stuff. In the 1920's, Gary Davis was a jazz player, he had a jazz players sensibilities. He'd improvise over changes, you know. He learned all of those band songs coming up, he said. And, of course, Louie was all the rage. When you learn a Louie song like Potato Head Blues or Coronet Chop Suey in a Gary Davis key like C, you see that it's just the perfect stuff for Davis' style of playing. The horn lines are the melodies that Gary plays and the band chugging along is what Gary's playing with his thumb. Of course, learning any Louis Armstrong lick is a great education. Jim Pharis - Do you think, in general, that it's a good idea for guitarists to listen to instrumentalists other than guitarists? ErnieHawkins - Oh, certainly. That's not to say that you shouldn't listen to guitarists. But if you want to hear how a line works, go to a player like Louie Armstrong. Use a lead sheet, whatever works for you. Anytime you listen to other players it helps, it's a great thing. Jim Pharis - Were there any piano players that had the same effect on you? ErnieHawkins - Yeah, I listened to piano players a lot, boogie woogie piano players. Aside from Jelly Roll, James P. Johnson, Fat's Waller, those kinds of people. Those were my big piano people. Of course, Gary's style is thought to be piano influenced. In fact, he said that it was like playing a piano. It is a piano style but there are times when it becomes an orchestra style too. Jim Pharis - Can you tell us about any other instructional DVDs that might be in the works now? ErnieHawkins - I'm not really thinking about another one right now. I'm just trying to finish up the Broonzy and Bix ones. I have thought about doing one of Standards - showing people how to play standards in this style. How to do an arrangement using a lead sheet. Jim Pharis - Does the setting that you're playing in affect your instrument choice? ErnieHawkins - No, not really. Most of the time it's the J-200. I can use the pickup that's in it in when playing with the band. Jim Pharis - What kind of pickup is it? Jim Pharis - Do you have onboard volume and tone controls with it? ErnieHawkins - No, you have to come out into a pre-amp. The Fishman system that I used to use did have onboard controls. Jim Pharis - Is the K& K a more transparent sound than the Fishman? ErnieHawkins - Yeah, I think so. Jim Pharis - You're known as being a fan of Gibson guitars. Any other instruments in your collection? ErnieHawkins- Mostly Gibsons. I do have a Beard round neck resonator and an old National. Jim Pharis - Do you always use plastic fingerpicks? ErnieHawkins - Most of the time I use plastic, although I've been playing without picks some lately. I'm getting ready to do a Big Bill Broonzy DVD and it's tearing my nails up. I've started using Alaska picks for that and I like them too. Jim Pharis - Do you ever use acrylic nails? ErnieHawkins - Occasionally. If I break a nail while doing a DVD I'll go and have one put on. Jim Pharis - Is the choice to use nails or to play bare fingered always based on the style that you're playing, Gary Davis compared to Mance Lipscomb, for example? ErnieHawkins - To a large degree it is. I do pretty much always use picks when performing. If I'm teaching the style of someone who didn't use them, like Lightning Hopkins, I won't use them. Jim Pharis - Is your not using metal picks purely based on your early association with Gary Davis? ErnieHawkins - I used metal for years. When I began doing the Gary Davis DVDs I went back to plastic so that I could get that Gary Davis sound. I've stayed with plastic since then. You won't get his sound without them and a big plastic thumbpick. Jim Pharis - Any tips on how to shape the plastic picks? ErnieHawkins - (laughs) I don't know. You're on your own with that. You've just got to find the right fitting fingerpick. Jim Pharis - When you play a 12 string guitar, are you usually doing it because the artist on the song that you're covering played one? ErnieHawkins - No, if it sounds good on the 12 string, I'll use it. Gary Davis had the same approach and could play anything on it. If I'm in a 12 string mood, I'll play everything on it. Jim Pharis - You have played electric guitar quite a bit as well, haven't you? ErnieHawkins - Yes, I played electric guitar in bands for quite a while. I'm pretty good at it, but I'm a better acoustic player. Jim Pharis - Did you use a flatpick when playing electric? ErnieHawkins - Sometimes, but I mainly used a thumbpick and my fingers. Jim Pharis - Is there any particular type of electric guitar that you prefer? ErnieHawkins- I like Strats, they're my favorite electric guitar. I was living in Dallas in the early '70's and I got to hear the real early Thunderbirds. I really like Jimmie Vaughn. That was my favorite band and he was my favorite guitarist. I love the Strat sound that he gets. Jim Pharis - Do you have any suggestions for someone who wants to make a career of music? ErnieHawkins - It's really important to get as much education in music as you can and to become the best player that you can be. Be who you are, follow whatever you're passionate about, and just go for it. ErnieHawkins is a been there, done that, guitar player. He has studied and performed with the masters. You can find out more about his instructional materials, concert schedules, teaching seminars and recordings by visiting his website.